HandPunch 1000 is a necessity for every company, especially for small companies with 50 employees. 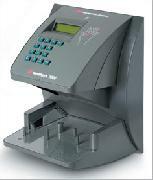 Wipaq can supply you Handpunch with 5120 Transactions, ID Number Length, and 50 Users Capacity. Additionally, Wipaq sells many types of HandPunch for commercial applications. Our HandPunch 1000 are manufactured to meet the exacting standards of the toughest commercial companies and small enterprise. Our HandPunch 1000 includes less size and weight with Baud Rate of 1200 – 28.8K bps. What's more, many of our Handpunch machines are accurate ensuring fast and easy to use. If you are looking to save money over card-based systems without Buddy Punching, you will need Hand Geometry technology. Wipaq has RSI’s field-proven Handpunch Machines in a variety of user capacity.